Like his brilliant character, Dr. Shaun Murphy, Freddie Highmore is something of a prodigy. The 26-year-old former child actor and Cambridge University grad has not only won praise for his portrayal of the autistic surgeon in The Good Doctor, he also wrote the Season 2 premiere and will direct an episode. Below, Highmore shares his diagnosis for the "hopeful and optimistic" drama. Four characters are becoming series regulars, and one is leaving. Shaun is on thin ice after making a near-fatal error during an operation in the finale. How does that affect him? Freddie Highmore: Shaun’s first assignment — going out with Dr. Jared Kalu [Chuku Modu] to run the local homeless clinic — doesn’t initially seem to be the most surgically interesting task. But with his personal experience of homelessness, he throws himself into it. And because of their newfound bond, Jared’s impending move to Denver will cast a lasting shadow. Shaun’s mentor, Aaron Glassman (Richard Schiff), resigns as the hospital’s president, and Marcus Andrews (Hill Harper) takes over. Will they get along? The hospital power structure’s rebalancing will have repercussions. Glassman was Shaun’s No. 1 advocate. Shaun will have to prove to Andrews that he’s worthy of a place at St. Bonaventure. 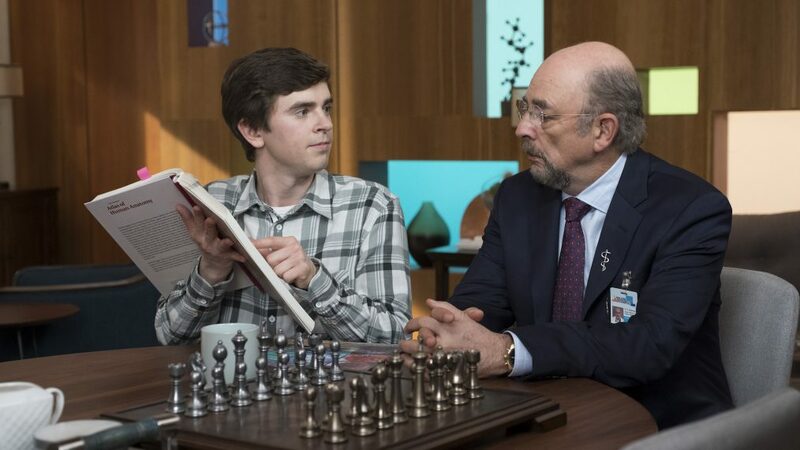 Highmore in Season 2 of The Good Doctor. Thanks to Shaun’s diagnosis, Glassman is being treated for brain cancer by noted oncologist Marina Blaize (Lisa Edelstein). Will Shaun and Blaize knock heads? He’ll certainly want to stay intimately involved with Glassman’s condition. Lisa is a great addition to the cast, and it’s fun to watch Dr. Blaize tackle Glassman head on. Shaun’s crush Lea (Paige Spara) is back! What can you tease about her return? It might not be the happy reunion people are expecting. Lots happened during their time apart, and it will take Shaun a while to process that she seems to want to stick around. The EP weighs in on the fates of Dr. Glassman and Dr. Shaun Murphy in Season 2. Will we see a more mature Dr. Murphy? Yes, but this season is also an opportunity to explore the reality that Shaun can be very frustrating, especially when others express a differing opinion that he refuses to accept. He’ll have to learn the art of compromising!